As the second brew day in a row, this batch actually started last summer. One of my friends from my homebrew club started Lazy Monk Brewing. He gave me a recipe for a biere de garde as a possibility for one of his seasonal beers. This last year was pretty crazy, so I hadn’t gotten around to brewing this recipe. We moved twice and it took a while to get settled into our new house. So, I figured I’d see how this recipe turned out. Since the recipe was created by Leos, I figured the only appropriate beer to drink while brewing this recipe was his Bohemian Dark Lager. It started the brew day off on an awesome note and provided a relaxing background flavor to complement the fun of brewing a new recipe. I’ve never had biere de garde, so I’m not sure what to expect in the finished product. It’s a lager fermented a little bit warm to contribute to the flavor. This batch, fermentation started at 59 degrees Fahrenheit and heat from fermentation rose the temperature to 61 degrees over the course of fermentation. I’m really looking forward to seeing how this turns out! 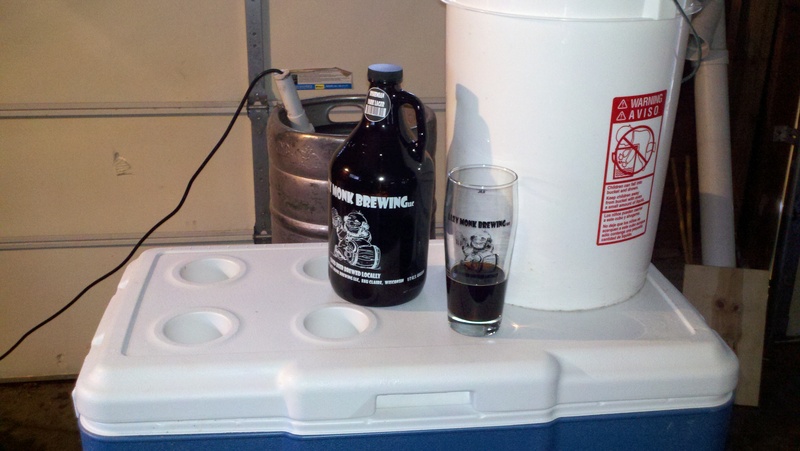 The hydrometer sample tasted awesome, as did the sample at bottling time. When you try a new recipe, do you first brew a smaller than normal batch to see if you like it or do you just go for it? So far, I just brew a full-sized batch and hope I like it. Let me know what works for you. Boiled for 90 minutes, being really careful as the boil started. It was nerve-wracking with the wort so close to the top of the kettle.